Wisit is modern hardware-software integrated system for management and control of accesses by cards. Wisit regulates the access and the visitors path across offices and buildings. 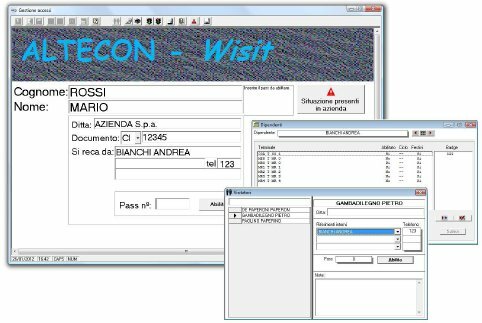 Wisit può utilizzare sia tessere magnetiche che transponder a seconda delle esigenze e delle preferenze del cliente. Wisit can use both magnetic and transponder cards, depending on customers' needs and preferences. Base terminals can be installed in a standard 503 box and can be connected to the computer by an IP or RS-485 dedicated network. To assure the best security and efficiency, the terminals store the permissions in their own internal memory, allowing them to continue to operate even with a fault to the network or computer. The Wisit Software operates in computers provided with Microsoft Windows® operative system and allows to configure and interact with the access control. The reception interface is designed to improve the efficiency of the personnel and to enable cards for visitors with few, easy, step. E.g. is possible to automacally enable the gates needed to reach the specific internal resource where the visitor awaited, or manually select each gate and choose if the visitor can access to it or not. Personnel management is configurable as needed, allowing to define options like weekly cicles with festivity check and daily time slots. The Wisit access control integrates many functions developed to make the use as safer as possible. Cards are automatically disabled when the visitor leaves the place, without the need to give them back to the reception. Moreover, cards can be disable anytime. This functions is very useful if the card has been lost. To make the emergency and control operation easier, Wisit integrates the Present in the office function. With this function is possible to immediatly access to the status of visitors and personnel. The access to Wisit Software is controlled by a password, available only to enabled personnel. Every operation made is trackable and documentated. Only the allowed operators are authorized to consult the access data, guaranteeing the respect of personnel and visitors' privacy.